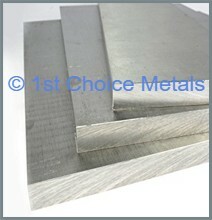 As well as Aluminium sections, 1st Choice Metals are also an Aluminium sheet supplier and Aluminium plate supplier. From stock we supply Aluminium Plain Sheet and Aluminium Plate from 1mm thick through to 2.1/2” (63.5mm) thick. Should your application require thicker plate, a grade or specification not currently listed on this website (i.e 5251, 5082, 2014 or 7075), or a sheet / block of plate that is larger than is currently offered then please contact us and we will respond to you quickly with a quotation. Due to the method of production, Aluminium Sheeting & Aluminium Plates are termed as Rolled Products, although the precise method and the grade in which the product is offered is dependent upon the thickness required. These are Cold Rolled products. A cast slab of Aluminium, usually around 600mm thick is heated up to around 500 degrees. Now very soft, the ingot is repeatedly rolled down until it reaches approx. 6mm thick. At this point the sheet is then coiled and allowed to cool. The coil is then annealed, cooled again and is then cold rolled down to its finished thickness. Finally, the metal goes through a flattening process and is cut to the required length of Aluminium sheet. The cold rolling process gives the surface of the Sheet Aluminium a lovely smooth and shiny finish, with a very slight visible grain. This excellent finish means that Aluminium Sheets are ideal for use as reflectors in lighting applications. 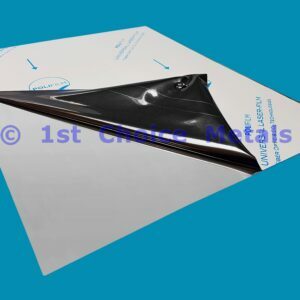 A thin, easily removable PVC coating is then applied to the one face of the sheet. This protects the sheet from scratching during the cutting, transport and any fabrication processes. As standard all of our 1mm, 1.2mm, 1.5mm, 2mm, 3mm & 4mm thick Aluminium Sheeting is supplied in grade 1050H14, which is an excellent general purpose grade. It has excellent formability, and is also perfect for Mig & Tig welding, soldering and brazing. It is excellent for forming and moulding and is commonly used as aluminium panels for classic cars, kit cars & sports cars. Should you require your Aluminium Sheet folded, fabricated or welded, then please contact us for a quote. Grade 1050H14 Aluminium Sheet metal contains a minimum of 99.5% pure Aluminium. It is work hardened during the rolling process and is classed as half hard, making it a medium strength alloy. The other benefits of grade 1050H14 Aluminium Sheets are that they have excellent corrosion resistance – making them suitable for outdoor use, they are suitable for anodising or powder coating, and of course they are lightweight – just one third of the weight of steel. Owing to the above features, Grade 1050H14 aluminium sheets are often used in the manufacture of signs and curtain walling for use on shopfronts and the highways. You will also regularly see these aluminium sheets on vehicle bodies such as Luton boxes, horse boxes, trailers and also as replacement panels on coaches & buses. Over the last 10 years we have discovered that artists love to paint on metals sheets and we are regularly asked to supply various artists with Aluminium Sheets cut to size into panels, which are used as an alternative to traditional canvas. The jewellery industry is another where Aluminium Sheet and Aluminium Tubes are currently very popular. Some are manufacturing items such as rings directly from the aluminium that we supply, whilst others are buying Aluminium Sheets to be used as metal stamping blanks. Aluminium sheet really is great for making items such as keyrings, charms and tags as it is very easy to cut, shape and stamp onto. 5mm thick & 6mm thick Aluminium are thicknesses that sit between cold rolled sheet (up to 4mm thick) and hot rolled plates (From 8mm thick upwards) – therefore these sizes of Aluminium Sheet / Plate are sometimes referred to as Shate. Although still relatively thin, our 5mm thick and 6mm thick Aluminium Plates are supplied in Grade 6082T6 rather than 1050H14. 6082T6 is a much harder and stronger grade of Aluminium in comparison to 1050H14 and therefore lends itself to more structural applications. It has very good machinability – because it is so much harder than grade 1050H14, 6082T6 chips nicely when machined whereas 1050H14 is too soft and will clog up cutters & tools. It is also good for drilling and therefore 5mm & 6mm Thick Aluminium Sheets are ideal as base plates for machinery and are also commonly used as sump guards on performance cars. Our 5mm & 6mm Thick Aluminium Plates come with a PVC coating on both faces, meaning upon delivery, your plate will have 2 scratch free surfaces. 5mm thick & 6mm Thick 6082T6 Aluminium Plates are also excellent for welding and also have excellent corrosion resistance. One downside is that 6082T6 Aluminium does not readily lend itself to bending or folding – however with the addition of heat, and great care a certain degree of bending is possible. These thicker Aluminium Plates are hot rolled. As with the thinner sheets, they begin life as a 600mm thick cast ingot which is then heated up. It is then rolled out to the desired finished thickness and cut to size. Generally, the surface finish of hot rolled 6082T6 plate is not as good as the thinner cold rolled grade 1050H14 sheets. However, this is often of little importance as these thicker aluminium plates are most commonly cut into billets and either turned or CNC machined down into smaller parts or components. 6082T6 is the most common grade of Aluminium Plate in the UK. Although it is not classed as the free machining grade of aluminium – Grade 2014 takes this accolade – it does machine very well and is cheaper than 2014. In short grade 6082T6 Aluminium Plate is what is used in every single engineering workshop, every day throughout the country for machining applications. Aluminium Plate in grade 6082T6 is therefore often used to manufacture lost wax dies, jigs, parts for cars and motorcycles, & machined parts for the food processing & packaging industry. Because 6082T6 Aluminium plate is designed to be machined prior to use, it comes without any PVC coating on either face and as such surface scratching is to be expected. If you have a machining job to do, why not order a ‘lump’ of plate from our website and then take advantage of our cutting service which will allow you to receive your Aluminium Plate cut down into the required number of smaller blanks ready for you to work on.